Ruth Wilson stars as her own grandmother Alison in the true story of a woman’s search for her husband’s real identity. At the outset of World War II, Alison McKelvie took a secretarial job with the Secret Intelligence Service. There, she fell in love with an older man—Major Alexander Wilson, a popular author of spy novels then doing real intelligence work for the war effort. Little did Alison know, but she was entering a plot as tangled as one of the major’s mind-bending fictions. Mrs. Wilson on Masterpiece airs in two thrilling episodes Sundays, March 31 and April 7, 2019 at 9 p.m. on WXXI-TV. Wilson also served as executive producer, playing a pivotal role in bringing her family saga to television. “I would tell various people the story, and they all said to me, ‘you’ve got to get this made,’” she says. Iain Glen (Downton Abbey, Game of Thrones) costars as Alec, a glamorous and seductive operative in the mold of James Bond, which is no accident, since Alec’s novels pioneered the character of the debonair spy, based on Alec’s own qualities. This personality type was later exploited by Ian Fleming in his Bond books. 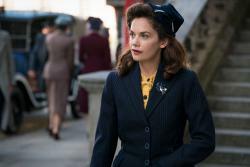 Also appearing are Keeley Hawes (Bodyguard, The Durrells in Corfu) as Alec’s second wife, Dorothy; Fiona Shaw (Killing Eve, Harry Potter) as his British spymaster, Coleman; Anupam Kher (The Big Sick, Silver Linings Playbook) as his handler in India, Shahbaz Karim; and Patrick Kennedy (Churchill’s Secret, Boardwalk Empire) as Dennis, Alec’s son, whose surprise appearance spurs Alison’s quest into her husband’s mysterious past. Mrs. Wilson opens in 1963, when Alison and Alec have been married for more than 20 years and have two grown sons. While working on his new novel, Alec suffers a fatal heart attack. Not long after, the grief-stricken Alison is confronted by a woman claiming to be Alec’s real wife, Gladys (Elizabeth Rider). Then, at the funeral, Alison is approached by Alec’s colleagues, who offer condolences but refer to puzzling aspects of his work and personal life. Seized with doubt about the man she thought she knew, Alison is determined to find out who Alec really was, while keeping her discoveries secret from her sons, Gordon (Calam Lynch) and Nigel (Otto Farrant), who have nothing but happy memories of their father. Nervously, Alison tracks down Coleman, Alec’s old spymaster, and enters the looking-glass world of secret intelligence, where agents assume identities, pursue careers, fake romances and undergo public humiliations, all in the name of serving their country. The problem is: if the agency never spills its secrets, how is one to know which identity, job, lover or disgrace is real and which is part of the great game of deceit? Even worse, given Alec’s gift for creating plots, how much of what he confided to Alison was true, and how much did he make up and possibly end up believing himself?